The SelectAir Powered Mattress is quiet, portable, lightweight and reliable. 400 pound Capacity. Shoulder and Foot Bolsters included. MOXI SelectAir® low air loss mattress system is a powered and adjustable mattress replacement system offering the most cost-effective alternative for skin protection and pressure sore prevention. SelectAir® controls moisture with wicking action; air gently blows underneath a vapor-permeable cover, wicking moisture away and keeping the skin at a healthy moisture level. The wicking method has several benefits over direct airflow alternatives. It is much less likely to over dry the skin (a clear contra-indication to moist wound healing). It also reduces the risk of airborne pathogens, and provides additional comfort for patients who tend to feel cold or simply find it unpleasant to have air blowing directly on them. SelectProtect®, is designed to be used exclusively with standard SelectAir® or SelectAir MAX® Low Air Loss Mattress Replacement Systems and without bedside rails*. 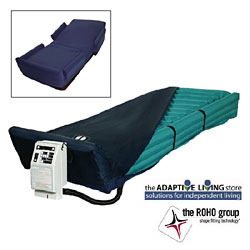 The unique built-in bolsters help promote a safe sleeping environment without compromising the patient's sleeping area. The SelectProtect® is not a restraint device. It is not designed to limit the patient's movements on the mattress or restrict the caregiver's access to the patient. * Use of SelectProtect® should be determined based upon facility protocols, applicable laws, regulations, guidelines and individual user safety considerations. It does not replace the need for patient fall prevention measures. Warranty: 12 month limited warranty on mattress, 1 year limited warranty on cover, soft goods, and control unit.